Expandable utility Sport team wagon inspired colors, fold with one pull on the toggle, extra wide adjustable all-terrain rubber wheels, loopholes (from fishing rods to tennis racquets), two front pockets, six pockets along with flaps to hold gardening tools, drink holds, pockets for phones and keys. 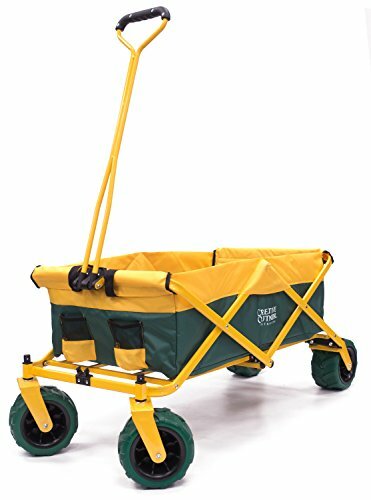 DIMENSIONS: Open - 20"H x 42-1/2"L x 19-1/2"W plus 30" handle; Collapsed and Folded - 30"H x 20"W x 7-1/2"D; Fabric wagon body interior - 32-1/2"L x 17"W x 10-3/4"H. Weighs 20 lbs. Supports up to 150 lbs. STORAGE: Simple set up - folds up to fit in most car trunks (no assembly required). Fold the wagon by one pull on the toggle. Comes with travel/storage sleeve. If you have any questions about this product by Creative Outdoor Distributor, contact us by completing and submitting the form below. If you are looking for a specif part number, please include it with your message.